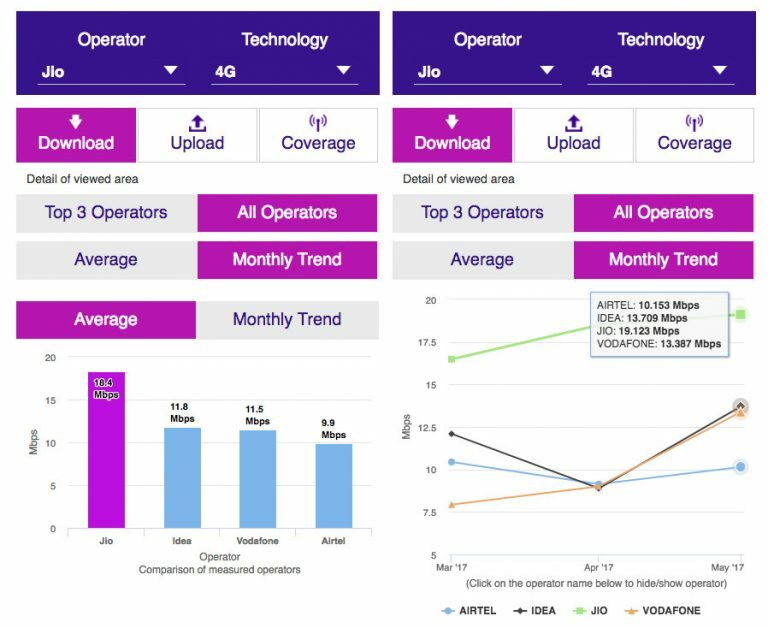 TRAI data shows that Reliance Jio tops the download speed with a speed of 19.123 Mbps, followed by Vodafone at 13.387 Mbps, Idea at 13.709 Mbps and Airtel comes at last at 10.153 Mbps. Reliance Jio’s download speed keeps climbing every month, based on TRAI data. It was 16.487 in February and 18.487 in March. Even though Reliance Jio tops the charts in download speeds, Idea tops that chart with upload speed of 8.459Mbps, followed by Vodafone at 7.333Mbps and Reliance Jio at 5.275Mbps. TRAI says that the results represent the average of the data speed samples collected from various consumers of the TSPs on a crowdsourcing basis during speed test initiated by them. Back in October last year Reliance Jio was slowest among the top operators based on the same TRAI MySpeed data, now it seems to have improved a lot. How good is Reliance Jio in your location?